Summary: Learn how to apply natural wood finishes, apply varnish, apply wood stain, apply dye, apply wax and apply oil. Natural wood finishes can be used to nourish and protect wood or to transform its appearance. Most natural wood finishes are available in water-based or oil-based forms and can be used on internal and external surfaces, with the exception of wax which is for interior use only. Remember to choose an appropriate finish for interior or exterior application. 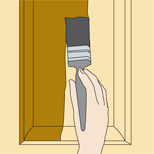 Remove old paint and varnish using a heat gun or chemical solution as explained in the project on painting doors and doorframes. Using a sanding block smooth the surface that will have the finished applied to it. Larger areas like floors and stairs may require the use of a power sander as described in the project on sanding floors. Before applying a finish, if you have sanded the surface, vacuum thoroughly to remove any dust. It is a good idea to put off applying your chosen finish for a day or two to allow any remaining dust to settle and then vacuum again. Using a paintbrush apply the varnish over the surface in the direction of the grain. Lightly run the tip of the brush across the wet surface to create a smooth finish. This is a painting technique called laying off. When the first coat of varnish is dry, sand down the surface as varnish can lift the grain of the wood. Use a damp cloth to remove any dust and let the surface dry before applying a second coat. Continue to apply coats until you achieve the desired finish. Apply the varnish in the direction of the grain. Stain is a very popular finish as it darkens and colours the wood. Stain is not only decorative but some products can preserve the wood too. Stain is available in a matt or a gloss finish and can be oil or water based. Try a test patch of stain in an inconspicuous place to see how the colour develops. Divide your surface into different sections e.g. the different panels of a door or parts of a window or doorframe. Where one section joins another take care that the brush strokes don't overlap. 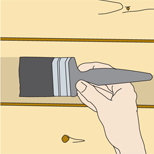 Paint the stain onto the wood in the direction of the grain, making sure you brush out any drips. Always finish the surface you are staining before taking a break, otherwise a line will form indicating the areas that have been stained at different times. Apply at least two coats for the best finish. Paint in sections, always following the direction of the grain. If you want to create your own colour by mixing two dyes they must both have the same base - oil or water. When the colour has been absorbed, protect the surface with wax or varnish Check with your supplier or the manufacturer to ensure that the protective finish you choose is compatible with your dye. 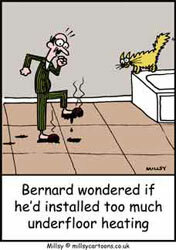 Wax should only be applied to interior surfaces. Scoop the wax onto a soft cloth and apply to the wood in the direction of the grain, rubbing the wax in evenly. After a few minutes drying time, buff the wax with another cloth to achieve a smooth and attractive finish. Apply as many coats as necessary to produce the desired finish. Wax is quite a high maintenance finish, as it needs to be re-applied regularly to maintain an attractive finish. Use a soft cloth to apply in the direction of the grain. Pure Tung oil is non-toxic and therefore an excellent finish for food preparation surfaces in the kitchen. Danish oil and teak oil are excellent for hardwoods and are widely used on garden furniture. Teak oil will produce a glossier finish than Danish oil. If applying linseed oil use the boiled or double-boiled variety as it is not as sticky as the raw linseed oil and dries much quicker. Using a soft-bristled paintbrush apply the oil in the direction of the grain. The oil should be allowed to penetrate the wood before removing any excess with a cloth. After a further half an hour use a dry cloth to buff the surface.